The Department of Economics is currently offering two graduate programs: A Master of Economics (M.Ec.) and a Master of Science in Economics (MSE). Below you can find descriptions and degree requirements for both programs. The M.Ec. program requires the completion of a capstone course as the culminating activity. The M.Ec. requires a completion of a minimum of 31 credits, including one course in math for economists, two core courses in microeconomic theory, two core courses in statistical methods and econometrics, four courses in electives and three credits of capstone course. The program with a special session in August of a 2-credit course in mathematics for economists. A required meeting with the graduate coordinator will take place typically during your second semester to discuss your project to be completed in the capstone course. A cumulative grade point average of 3.0 is required for continuation in and graduation from the program. All requirements for the degree must be completed within a period of seven years. This program emphasizes research and culminates with the completion of a thesis which puts your newly acquired research skills into practice. The intended audience are individuals seeking to further their skills in research. This program can also act as a bridge to a PhD program in economics and related fields. 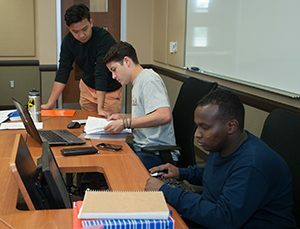 The MS in Economics program provides students with advanced training in current microeconomic theory, quantitative economics, econometrics, and other fields of economics as well as rigorous research methods. The MS in Economics requires completion of a minimum of 31 credits, including one course in math for economists, two core courses in microeconomic theory, two core courses in statistical methods and econometrics, three courses in electives as well as six hours of thesis work as the culminating activity. The program with a special session in August of a 2-credit course in mathematics for economists. After a student completes a minimum of 9 credits of coursework, he/she will work with the graduate coordinator or graduate supervisor to develop a topic for the proposed thesis. All students are expected to have an initial meeting with the graduate coordinator to discuss their options, however, they can choose to work with any graduate faculty as their thesis supervisor. Meetings with the graduate coordinator and thesis supervisor will typically take place in a student’s second semester. Nine credits in approved courses that represents a disciplinary or interdisciplinary focus area. Courses must be approved by the graduate program director and cannot include more than 3 undergraduate credits. At least three credits must be economics electives. The deadline for both programs (M.Ec. or MSE), if you want to be considered for Graduate Assistantships or Fellowships, is February 15, 2019. This deadline relates to both the Traditional or Accelerated 4+1 option. There is no official application deadline for those who are not seeking financial support. The MSE and M.Ec. programs can also be completed in a traditional format, taking 2 years to complete or an accelerated 4+1 option. For the accelerated 4+1 option, Boise State students may apply for the master’s programs after they complete 75 undergraduate credits; during their final two academic semesters as an undergrad, they are expected to take two graduate-level economics courses (ECON 521 and ECON 522) that count for both your undergraduate and graduate degrees. Once the student graduates with a bachelor’s degree, then he/she continues with the remaining master’s courses and completes the degree in one year. Click the faculty names to read about them.